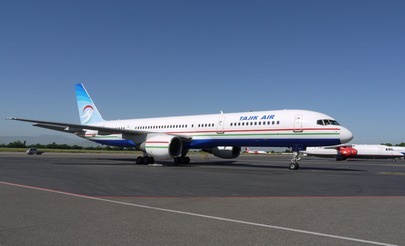 Tajikistan’s flag carrier Tajik Air has taken delivery of its third Boeing 757-200 long-range narrowbody. The aircraft arrived at Dushanbe airport on October 24. According to open sources, the airliner (registration EY-757, serial number 30338/891) was built in 1999. It was previously operated by the Russian carrier NordWind. Tajik Air is leasing the aircraft from Boeing Capital. Unlike Tajik Air’s other two 757s, the new aircraft seats 230 all-economy passengers. Tajik Air’s fleet also includes two Boeing 737-400s, one Boeing 737-300, one Xian MA60, two Antonov An-28s, a single An-26, and three Mil Mi-8MTB helicopters. The carrier is reportedly in talks over the possibility to lease another airliner of an unspecified type. Tajik Air’s route network includes Bishkek (Kyrgyzstan), Almaty (Kazakhstan), Urumqi (China), Tehran (Iran), New Delhi (India), as well as the Russian cities of Moscow, St. Petersburg, Sochi, Samara, Yekaterinburg, Surgut, and Novosibirsk.